I just want to THANK YOU all for coming out and having fun with us, it is always great to meet old and new friends, If you want to come out and join us just check out www.meetup.com and in the search put carpys cafe racer meetups and we will pop up with our schedule of rides etc. And if you would like to be a part of the 59 Club and want to know more about it, check it out here. 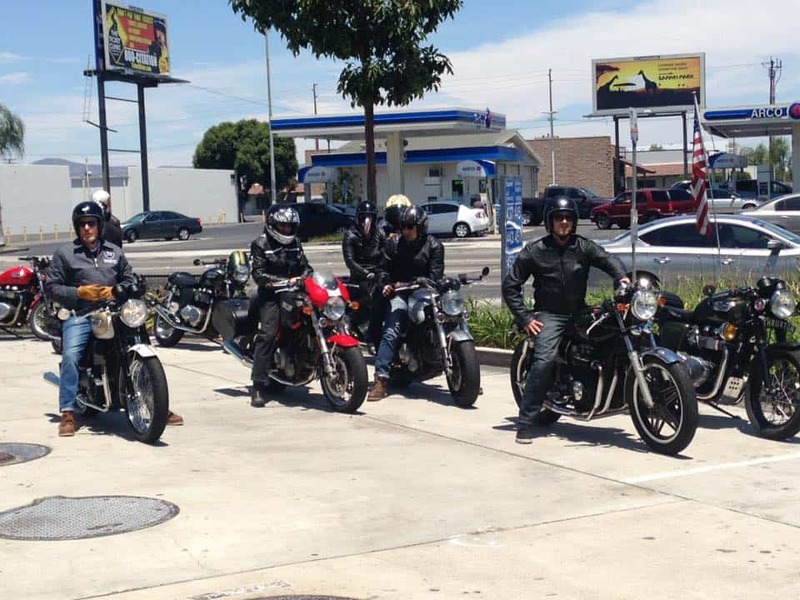 What a great day we had on Sunday, Blue skies albeit the Sun was Baking in Anaheim, but- once we saddled up at Alea’s cafe, we headed towards the sea and I tell you, it was a welcome feeling of the cooler temperature and sea breeze as we approached Pete’s Grill on Brookhurst. We had a nice little turn out today, about 12 came to the Cafe to meet up and it sure was nice to hear all them exhausts hitting different tones as they wound the loud button up and we headed for the freeway. The ride was at a nice pace as we had some new people attend and great to meet them too, we stayed in formation and headed up the 91 to the 57 past Anaheim Angels Baseball Stadium , I moved up and down the group and so awesome to see and hear all these cool Motorcycles as we wind our way towards the beach town of Huntington. We stopped off just down the road to get gas and bloody hell its already gone up 75 cents a gallon since yesterday, sneaky buggers! We tend to fill up here as the freeway is about 500 yards ahead of us and easy to get to places from here when we go on a ride. The other side is Arco but they tend to serve laquer thinner most of the time. We all gassed up and seeing as the price of petrol is sky rocketing in So Cal, glad we were on Motorcycles. I think Bryan below was texting the Government to say they are gouging us! Below, I have a quick Chin wag as to where we are going, whilst everyone fuels up on this hot July day. Blue Skies on this Sunday on July 12th a nice Breeze from the sea was already on its way and appreciated. Great fun to have cool people with Mike and His Mrs leading the way. More bikes here than KFC had nuggets. I was suprised at how many bikes turned up, this is a great little meet up of which we shall attend again at some point. Plenty of ringa Dinga Two Stokes here as well. Something for everyone here at Huntington and sure enjoyed looking around. Plenty of Triumphs about too as we take in all the fun atmosphere. This Bonnie was clean and really nicely done. Here was an Early Curtiss Arrow that would shake your fillings out! Plenty of Brit iron here and I loved everything that was on display. Not sure who the owner was as i wanted to ask what Chapter of the 59 Club he was in. Now this is how I would like to find a trumpy to restore. How many people learned to Wheelie on these? An Almagamation of Honda’s too, there is the GCR or gerards I built a few years ago. now has over 50,000 miles on it. Bryan’s CB650 sat in the sun and looked awesome. Wanted to chat to this fella with his Norton but he had to dash. A mixture of all brands and styles and that makes a good bike event. See if some of you can make this Monthly meet as its sure fun to go to. Early RD bought back great memories for me. KH kawasaki 500 were so popular back home but been 30 years since I have seen one. Plenty of them here and loved it all. You could smell the Castrol R.
Velocette was such a great time capsule here- loved to of owned this. All sorts to see with many coming in and out all day. litle harley Sprint was a rare sight to clap your eyes on. Another Velocette to look at, getting hard to find these days. I wanted to buy this 305 for Jennifer. Mach III would pull your arms off. memory lane here, such a rare find. Another hard to locate bike is this 400-4 Super Sport and what a great example this was. 69 trumpy was simply lovely. Little HD was catching plenty of attention. This guy was 75 years too late and batting for the wrong team! Pair of Matching Triumphs come rolling in. A motorcycle delight and so much to see and chat too. Honda Street tacker looked fun. Super-hawk cafe, the owner works for HONDA. This 750 Commando was clean as hell and I would of loved to have ridden it home. Another rare sight, the good old GT550 Suzuki. There was a nice turn out and people were all friendly and generally took an interest in what you were riding. Unusual Green Beemer cafe but it was Nice. Loved this GMC Swat team special and we need one for the club, anyone got one of these we can buy? Old customer of mine, I remember repairing the exhaust and adding tail light and signals 5 years back, great to see him still riding the SS. All sorts of bikes were here and thats what makes it Unique and fun, plus bikes came in and out all the time. I loved this Little Trumpy Bobber. Heading out as the infamous Gerard on his GCR Cafe Racer rode down from Palmdale! Always a cool collection of bikes and people and there were a few Guzzies too! You never get to see too many CB650 Honda’s but Bryan is a Customer of mine and this bike I redid for him sounds so cool on the pipe! So we decided to head back but via PCH seeing as there was a cool Breeze and it was great fun. PCH is always busy in the Summer, especially on a weekend but nice to slow down and check the beach and sights out. Classic shot of PCH and what a fantastic day we had with no issues. A few pics Below Steve Fellon in our 59 Club added. Nice little bit below that they blogged. This entry was posted in Uncategorized and tagged 59 club, 900 efi, ace cafe, bike meet, bonneville, brat, BSA, cafe racer, CB 500, cb750, cb750k, chopper, custom, Four stroke, kawasaki, norton, rockers, sprint, t100, T120, thruxton, ton up, tracker, triumph, two stroke, velocette, yoshimura.